I will admit that ever since I broke the one month to go to Total Debt Freedom that my eager anticipation has kicked up. Ever since I turned the page (literally) on the month of September and looked at the month of October, Total Debt Freedom Day has been staring me in the face. I seemed to need more of a thing to do . . . daily . . . so I’ve started doing this . . .
Yep, ever since the second of October, I have been crossing off the day before on the calendar. That way I can see how many days are done and how few are remaining. 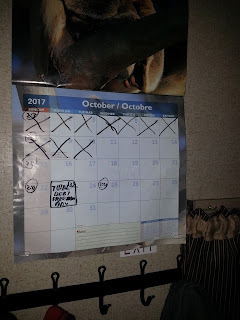 I also get the satisfaction of crossing off a day and telling myself that that day is done one down, so few to go. I use this and other little games to keep me occupied and my spirits up as the clock ticks down on this long journey towards wresting control of my paycheque back from the banks. I will turn this page on debt, so what if I chose to make up silly little rituals to keep me motivated (and thereby preventing me from doing not do anything stupid).